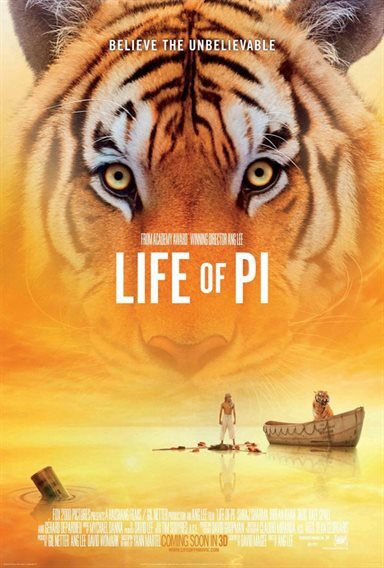 Download Life of Pi in Digital HD from the iTunes store. Life of Pi images are © 20th Century Fox. All Rights Reserved. 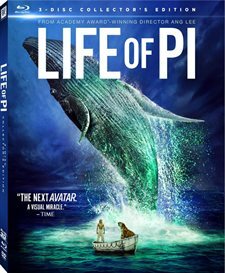 From flying fish to tiger strikes Life of Pi comes to home video with an adventure that will startle, amaze and exhilarate your senses. The movie received 11 Oscar nominations and won 5 including Best Director for Ang Lee. The production features some of the best cinematography I have ever seen on home video, especially the knock out 3D effects. The PG rated film should entrance the whole family with this fantastic unexpected voyage of a young man having the strength and will to survive the most horrendous event in his life. The story opens with Pi (Irrfan Khan), now middle-aged telling his incredible story to a skeptical writer (Rafe Spall) after being doubted when he got saved at the age of sixteen from being marooned at sea. At eleven the boy (played by Ayush Tandon) gets taunted by his fellow students with a surly nickname given him, but after a time gets them to accept his chosen one Pi. The story shows his young life with his many problems, his family and his religious upbringing. It later jumps to Pi (Suraj Sharma) now a 16-year-old living with his family at his father's hotel that has a huge zoo. Pi gets informed by his father (Adil Hussain) that they will be leaving India with the animals and traveling to Canada where he has acquired a position. Half way through the voyage the ship gets hit by a monstrous storm and the boat sinks. Now alone at sea on a lifeboat with a ferocious tiger, a frightened hyena, a wobbling zebra and an orangutan for company, Pi has to fend off the elements, strange creatures and attacks by the hungry animals. The movie shows the strength, ingenuity, faith and courage of Pi as he faces dangers beyond belief. Director Ang Lee gives his actor and crew a huge challenge of working on water with multiple cameras filming the action. His actor responds with a remarkable professional performance that makes his death defying scenes real and the voyage on a lifeboat an incredible adventure. His use of 3D to capture the drama of the sinking ship, the sea storms, sea life and a very mysterious island proves Lee's greatness. He also directs some terrific CGI that's so believable it should boggle your mind. His scenes of Pi fighting off the vicious tiger are so realistic that I found myself cringing at every move and near death escapes. I'm sure most everyone has seen the whale rising from the sea with the glow of the sea algae in the many trailers that were shown prior to its theatrical release and in 3D it becomes even more amazing and colorful on home video. The sound quality is astounding played on my home speakers using the HD-DTS Master Audio 7.1. From the sea storms, creaking of the boat, growling of the tiger, crackling of lightning to the ocean spray and dialogue you should not miss a word or sound effect. I even am able to manipulate the surround sound to fill the room giving me the feeling of being inside the movie, especially with the 3D version. The 3D set also includes a Blu-ray copy of the film along with a DVD and if you have your mind set for the 3D format in the future, it's the best value. The bonus extras are incredibly good and I highly recommend "Tiger, Tiger Burning Bright" after you have seen the film. "A Filmmaker's Epic Journey"- about an hour long this documentary goes into the creating of the film that took four years to make. It includes the special effects, interviews with several of the actors, and important production points. I am a film buff and have actually worked on film sets as those who have read my bio probably know and I enjoyed this feature very much and plan to watch it again. "A Remarkable Vision" Here we get to see visual effects up-close and personal. Be cautioned that it may take some of the magic out of the film. "Tiger, Tiger Burning Bright" This short extra shows how the film crew worked with CGI in bringing the angry tiger to life using a real one with stunt actors and an animal trainer. This extra is a must see after the movie. There are a Gallery with drawings of the characters that appear in the film and Storyboards showing how some of the sequences in the movie get made. In addition on the 3D disc there are some deleted scenes you can either play in 3D or 2D and something they call VFX progressions that show the sinking boat. Visually amazing! Story great! Theology... off, but it's a movie. I ended up owning it at sale price. Color and graphics are amazing!